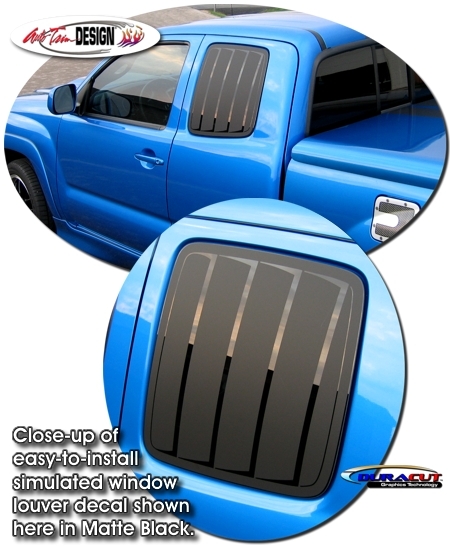 Trick out your '05-Current Toyota Tacoma with this simulated easy-to-install Window Louver decal kit. These decals are precut, apply directly to the Tacoma's Access Cab glass window panels and are available in a wide variety of colors. The design of the cutouts give the decals a 3-dimensional appearance and make the vehicle look great! Two (2) piece kit is made specifically for the '05-Current Toyota Tacoma and will not fit any other vehicle. Easy to follow general online application and care instructions are included. Please check your local/state laws and ordinances prior to application.